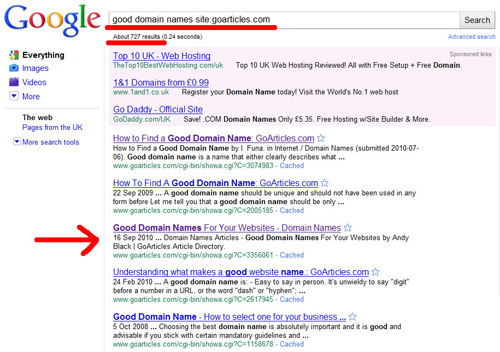 If you remember my last blog post which shown the difference between weak and strong articles based on the keyword phrase’ good domain names’. Well, I wanted to see how long it would take me to write a new article based around that same keyword phrase using Easy Article Rewriter Pro. Below are the exact steps I took…….. The first task was to write an article using the ‘Good Domain Names’ LSI library that I built last week (see last blog post). This library consisted of 99 relevant words. 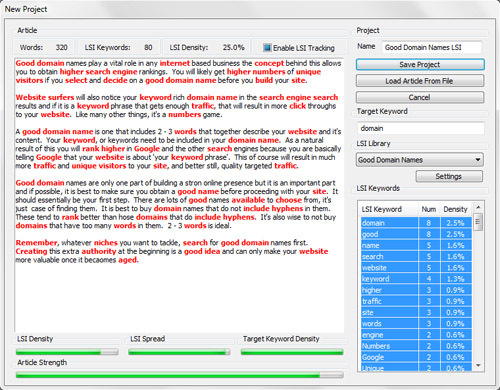 Once I selected the LSI library for this keyword phrase I started writing an article ensuring that the article strength indicators remained at a high level throughout. 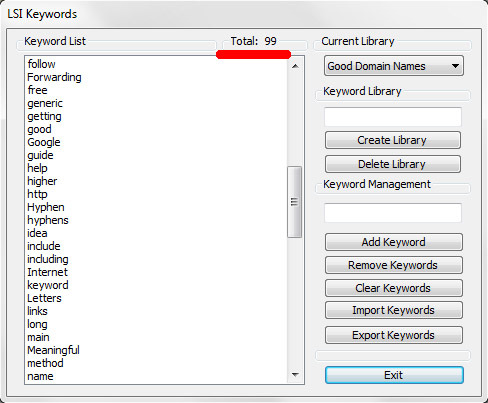 I also used the LSI library as a reference to help me identify core keywords which also helps with the writing process. It gives you ideas of what to write about! After writing the article I published it on Goarticles. I used Goarticles instead of Ezinearticles purely because Goarticles submission is instant. As soon as I added the article is became live within the directory and on the web. My next job was to get it indexed in Google. For this I use a fairly basic process. The first thing I did was link to the article from a forum signature. Busy forums are crawled constantly by the search engines as topics are forever changing and being added. After adding the link I constributed to the forum by replying to a couple of new threads.. and also a busy thread. I then added my article URL to a couple of ‘top’ bookmarking sites. 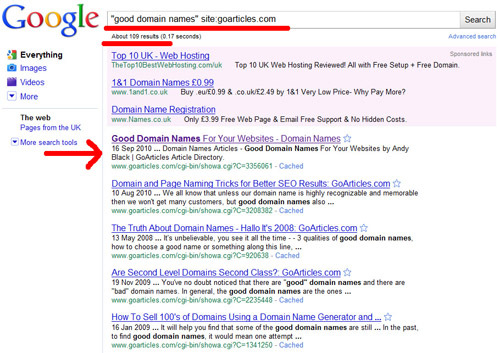 Although it took longer than usual to get indexed, it was picked up and added to Googles index within 2 – 3 days. (Normally this method gets articles indexed within 24hours). As you can see below, my article went into the index at no.3 out of 727 articles. The article is also ranked at no.1 for the same phrase surrounded in quotes (phrase match). If you write articles with a strong relevance to the ‘keyword phrase’ you are targeting then you have a very high chance of ranking your article ABOVE the other articles that also compete for that phrase. Higher rankings => more traffic => more powerful backlinks! I am still testing your Article Rewriter. It takes a little time to do it this way but I can see where it might get stronger results in the long run. I hadn’t thought of using the system to post in Goarticles or Ezine Articles but I will sure give it a whirl! Thanks for all the great tips and advice. Hi Andy.. you need to fix this misleading stuff. I think that it is quite misleading (and laughable) to screenshot a google search page – but limit the results to be from the website you put your article on. Indeed, when I search Google for your article as any NORMAL person would, your article is nowhere to be seen. Why intentionally mislead your potential customers? If you have a good product – you don’t have to lie. I am not trying to mis-lead people. Maybe I’m not getting my point across as well as I should be. I’m trying to show how you can use the software to rank above ‘other’ COMPETING articles. Not necessarily other competing sites. By limiting the results from other articles in Goarticles… or Ezinearticles is more likely to be a fair playing field. 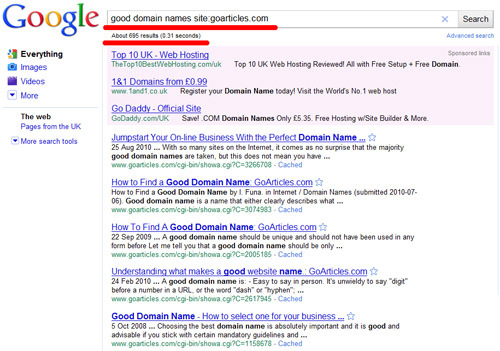 If I just wrote an article targeting the keyword ‘good domain names’ and I was competing against a website that had that exact phrase in its domain, had hundreds of relevant links pointing to it and it also had 30 pages within the site all related to domain names then of course it would e hard to rank higher than that site with an article from ‘Goarticles’. Of course, you setup you own keyword rich domain and used the software to write the strong content for the site then over a bit of time you would likely have a good chance of ranking highly. I’m not trying to mis-lead. I’m simply trying to illustrate in a simple way, how you can write articles that rise above the rest.. within the same playing field (same authoriy, little to no backlinks etc). If you can write high ranking content to start with, the backlinking and offpage stuff will just be easier. Your rankings would have meant something if you were ranked in Google and not in Go Articles. Still..your software is a nice tool to help in the writing process and makes it just a little bit more fun. I liked the video you linked to last week — great concept, so I downloaded the trial. I am somewhat visually impaired. Not having the maximize expansion to full screen seriously eliminates me as a user. Can this be corrected, please? The software is a dialog type application so it can’t be re-sized. We are looking at maybe implementing the ability to change font and text size though which will make it easier to use for some. Yes! If the font style and size could be increased it would be easier to use. How will I find out when you have done this? Basically, an update email will be sent out to all license owners. To download the latest version at any time you just need to download the sofware from the main sales page and then enter your activation email to unloc the software. The zip file will always include the version number, ie – v1.03 so just by clicking on the download button you’ll be able to see what version it is. If it is newer than the version you are running then you can download, install and re-activate. I would like to know how each LSI library is built. What is the degree of precision in relation to relevance of the topic written about, when you build it manually? Thanks for your comment. If you follow the instructions in ‘The LSI Code’ report which comes included in the zip file, it will explain how to create your library. n my opinion it is quite accurate as you are using Google to tell you the most relevant articles for a specific search term. By using just an article directory you are removing other factors such as varying site authority, backlinks and everything else. This generally means Google will give you the results based on the content itself rather than those other factors that would skew the results for the purpose of building LSI libraries. I will hopefully be adding a new feature in a future update of the software that will enable users to enter a keyword phrase and click a button. The software will then do all the manual work for you. Although generally it is only a 7 – 10 minute process, this feature will make it quicker and easier for users to do. Am I missing something or can I not actually see the list of LSI keywords in the same pane while I am re-writing the original article..? I answered your question on a reply to your other comment. As for videos, I will try and get some online asap which will maybe make things easiers for people to follow and understand. Nope- I just re-read the manual and went through an article re-writing session and there is no way that I can see to look at the LSI keywords while I am re-writing the original article. Um..wouldn’t it make sense to be able to look at those instead of trying to remember them..? And copying that Most Used List is a bit of a pain. It would have been great to have the preview panel actually be the panel where the re-writing of the article takes place instead of all of these windows having to be closed. Thanks for your comment. The LSI side of things is done within the ‘New Project’ window and is aimed more towards the writing articles rather than rewriting. An element of this is applied to the rewriting side in the ‘Preview Article window but I do see your point. Currently you would rewrite an articles, copy to clipboard using the button and then paste the article into a ‘New Project’ window and tweak from their using the relevant LSI library. It would be case of skimming through your article and tweaking the article to include more of the LSI words. Or some might prefe to add a few more sentences. I have taken this comment on board though and may look to include more LSI functionality in the main interface where you actually rewrite the articles. We have a few good ideas on how we can improve the app. We will be looking to add these features in a future update. I think we are missing the point made by Andy here. I feel it is a little more difficult task to rank in Google. But the point here is if Google is already showing any goarticles or ezinearticles in its SERP then now it would be yours. If you want to rank high and get to the first page, do some more work for it. Kay the tip on going back over a redone article and then adding more LSI terms from the list sounds much easier than the way I was doing it. I do still like that writing articles is much more fun this way though so I’m in on this one. If we already own Article Writer Pro do we need to purchase Easy Article Rewriter? to use the new software? Yes, Easy Article Rewriter Pro is a completely different application to Article Writer Pro. Article Writer Pro v2.0 is being developed soon though. It will be built from the ground up and will inlude lots more features. I’m also looking at making it easier to use. The design will be much neater too. v2.0 will be free to all current members of Article Writer Pro, so no extra charge will be applied for the new system once it is ready providing you are already a member of the Article Writer Pro. As for some videos on how to use Easy Article Rewriter Pro, ‘yes’ I will be creating some shortly and will upload them to the site once they are ready. I love this tool I have managed to create 5 articles in 2 days, submitted 3 to ezinearticles. And already when I do the ezine search they are coming up as #1 as revelant. Also checked in google and one of the articles is ranking at number #9 without any backlinks. Competition is around 300,000. I know its still early but this tool is amazing, its got me writing articles much easier and faster than anything else. Glad you have been successful creating good ranking articles using the new Easy Article Rewriter Pro software. Did you create the articles by rewriting PLR content or write the articles from scratch? Glad to hear you have created good ranking articles with the new Easy Article Rewriter Pro software. Out of interest did you write these articles from scratch or did you rewrite PLR content? I written them using plr articles then did a copyscape and they passed. I have so far written a few more following the LSI route and found that once I start writing my articles end up being over 500 words. It really does only take me 10-15 mins per article now. thank God i found your site! i’m sorting through all the useful tools you have to save MUCH time! THAT SOUNDS LIKE EXACTLY WHAT I WANT TO DO. CAN YOU UPDATE ON THAT? CAN I BUY THE SOFTWARE? ** – ALSO, when .com is gone, do you prefer .net or .org? similarly, would a hyphenated .com be better than .net/.org? i’m pretty new to all this, but finally have found a site that can help! I’ve read all the posts, and I just wanted to add that this software is brilliant! Why? Google is all about “relevance” nowadays. This software allows you to write absolutely relevant articles, posts, or content for your website. The software graphs allow you to see exactly how your LSI-rich content compares. What’s a neat little trick is to see how your competition ranks for the content on a competing keyword and see what LSI terms you can come up with from your competition to incorporate into your own LSI-rich content.